After an unprecedented senior campaign on the cross country course, predicated by a dominant state championship to cap off an undefeated season, Blue Springs South senior Victoria Findley returned to the track and won 16 of the 17 races in which she competed. 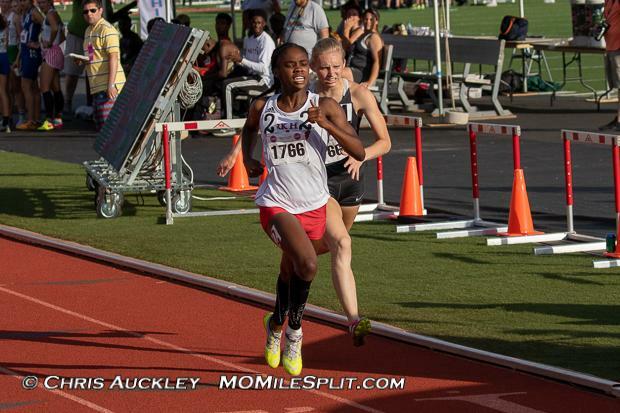 Her only loss came at the Park Hill Invitational 800 where her 2:16.34 personal best was only good enough for third. Over the four and eight-lap races, though, Findley was untouchable. Showing that killer instinct off the jump regularly, Findley continually jumped out to insurmountable leads, kept her foot on the gas, and cruised across the finish line in eye-popping times. On Friday, she entered with a personal best 1600 of 4:52.67 from KC Suburban Gold Conference and had cleared 5:00 three times - two more times than any other girls in the entire state. 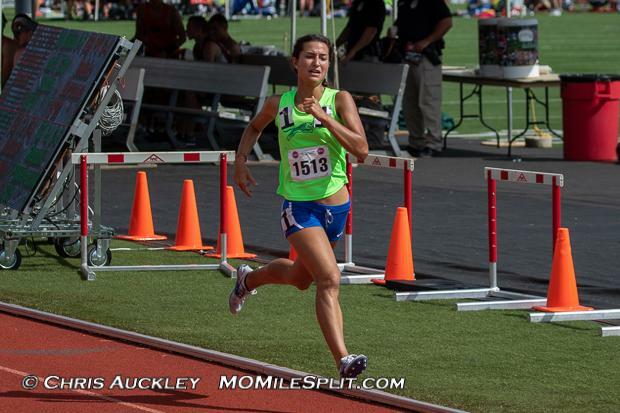 She would finish out the 1600 with another personal best, winning wire-to-wire in 4:51.07. Her next closest competitor was Park Hill South's Emma Roth, who would cross the line 12 seconds later in 5:03.91. Her only race of the day, Findley had made it a dominant one. 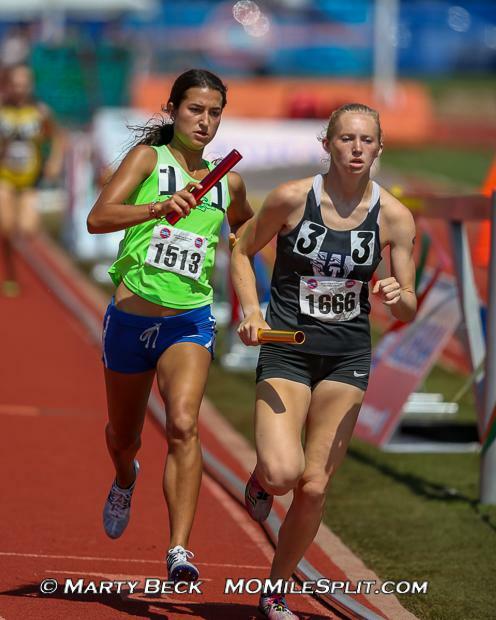 Saturday's first race was a little more competitive for Findley as she was given the baton on the anchor leg of the 4x800 a half second after 2:11 800 runner Jana Shawver of Lee's Summit West received hers. A flashback to the Shawver/Maddi Leigh dual from last year would come out all Shawver again as both girls sat hip-to-hip for 600 meters before Shawver used her electric foot speed to bury the longer distance star. Findley would still split 2:14.53, a personal best, and still looked her same, cheery self even after the second place finish in another taxing race. As the day wore on, the heat continued to rise outside which would dampen the expectations that any sort of records would fall this year. Nonetheless, Findley, much like her 1600 from Friday, would go wire-to-wire here, too, and win by 19 seconds. Much like her cross country victory, she would turn around and see her teammate, Danielle Hotalling (pronounced: Ho-ta-lling) cross the line second as she was able to clip Lee's Summit West's Madison Hulsey at the line. For Hotalling, it wasn't a personal best, but it was her highest career individual finish on the track and added a third career silver medal to her collection. But, she is more than okay taking second to her friend and teammate. "I think going 1-2 is better than getting first or second (alone)." Correction from the posted interview: Rock Bridge's Tyra Wilson is actually the fastest freshman in the state in the 300 meter hurdles. You read that correctly. After posting a US No. 2 42.94 in prelims, she returned for the finals on Saturday to post a US No. 1 for freshmen of 42.71 to grab the victory over Battle's Paige Magee, Marquette freshman Kennedi Watkins, and reigning champion Jaden Wiley. She didn't know she was ranked that high until we told her after her victory. "I had no idea that I was number (one) freshman in the country, it's really kind of hard to believe. I worked so hard, so I'm actually really happy to hear that." Wilson false started in the finals of the 100 meter hurdles at the sectional meet or else she would have been a fixture in the middle lanes this weekend, but she was able to grab another medal with her crew anchoring the 4x400 in 56.82. 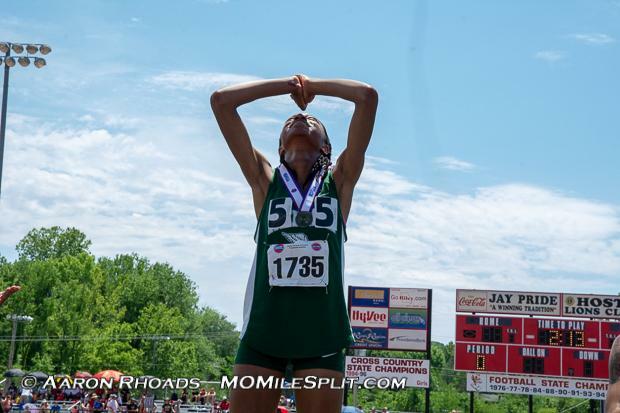 Heading into the Class 5 Girls 800, many Missouri track fans had already given the gold medal to reigning state champion Jana Shawver before the gun had even shot not just on Friday's race, but on the first race of the season. 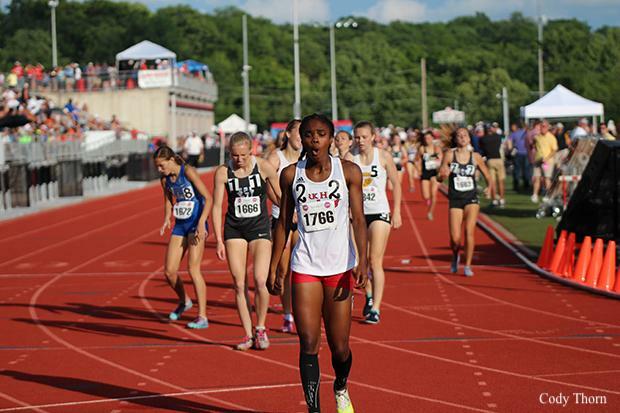 But former (and current) long sprints star from Park Hill Taiya Shelby had other plans. 2018 was the first season for Shelby and the 800 after a career in the 200/400 range. "It was something we decided to try at the beginning of the season. We had talked about it in the past, butI didn't really buy into it until this year," said Shelby about jumping up to the 800. "That first race went pretty well and I liked it so I continued to do it." That first race to which she is referring was a 2:18.12 at the Jerry Crews Invitational. She ran under 2:20 four total times this season including the 2:12.58 that earned her an 800 victory. The word "upset" is typically reserved for athletes who come out of nowhere to take down a heavy favorite, but while Shawver may have been a heavy favorite, Shelby hardly came out of nowhere to earn the win. Both girls have range from 200 to 800 and both have the kind of extra gear that is necessary to excel in the long sprints and middle-distance. It just so happened that, on this day, Shelby had a little more left in her tank. Nerinx Hall sophomore Courtney Williams got a shout out on twitter from Olympian Alyson Felix after her performances at this season's Festus Early Bird Invitational and ever since then, she has been on a crash course for state stardom. Over the weekend, Williams went for the sprints treble, but knew she was going to have some talented girls to race against in order to accomplish said feat. "They're absolutely amazing, we all push each other...and we're all just happy to see each other succeed." 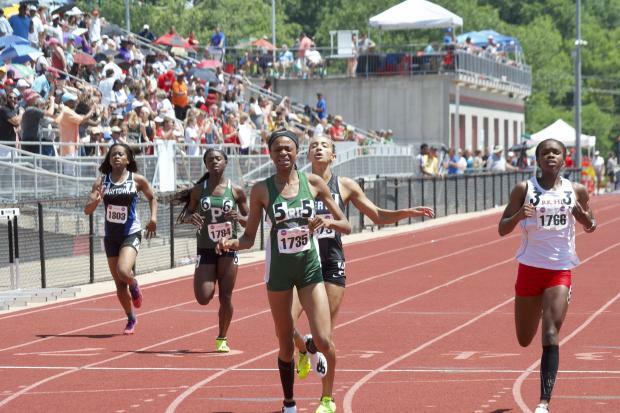 She was unable to pull off the win in the 100 as that went to Pattonville's Jada Moore in 11.93, but she did still finish second in 12.09. She would then edge out the likes of Kaitlyn Lewis and Taiya Shelby in the last 20 meters for what even she thought was an improbable win. "Part of me told me I wasn't going to get it, and then at the end I just put it away." Williams came back later to compete in the 200, but was unable to put that one away as she would finish third behind Smith-Cotton's Monique Grant and Jada Moore. Regardless, big things appear to be on the horizon for Williams as she will surely be back to seek out the sprints treble again in 2019. 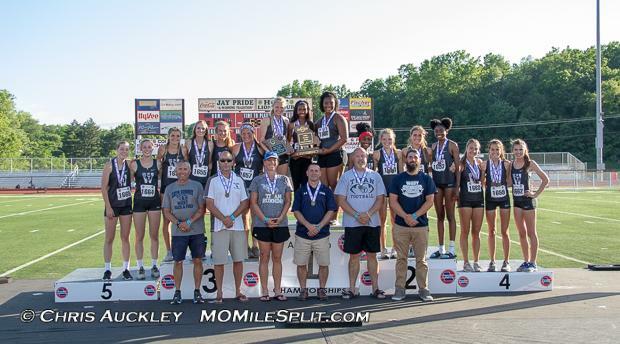 Lee's Summit West tears up most things, but in the throws, they ended the weekend with wins in the shot put, discus, and javelin, as Makayla Kelby dominated the shot and discus and Maddie Harris earned her first state title. 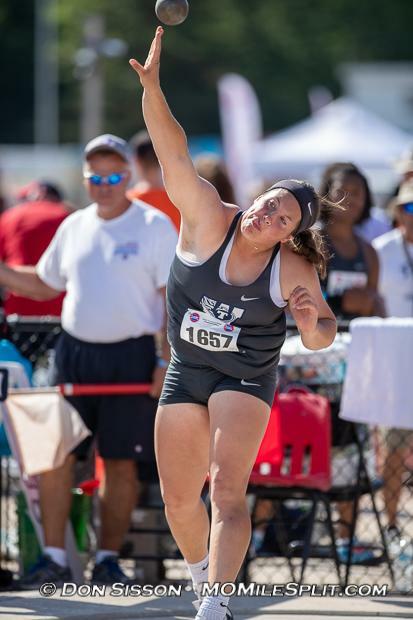 There was little doubt that Kelby would secure victories in the shot put and discus as she came in as the top ranked girl in the entire state in both. She was disappointed, though, with her shot put as she said she was shooting for a 50+ mark that she had thrown in practice, but she had to settle for 46-7 and the victory on Day 1. The next day, Kelby chucked the discus a new all-class record 166-8 and secured the comfortable victory early on. This was not a personal best for her, though, as she has thrown 170-9 this year, a US No. 2 mark. She heads off to the University of Washington and should be competitive at the NCAA Division I level very soon. Junior Maddie Harris will return to defend her javelin title next year, though. She took third as a freshman and second as a sophomore for winning this year as a junior in 138-2. 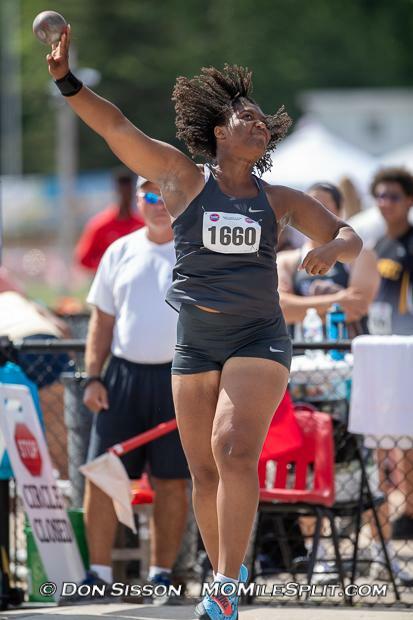 She threw over 130-0 nine times this year and only seventeen girls in the state threw over 130-0 once this season. While Harris will close out her junior year MO No. 2 and US No. 14, big things could be on the horizon for this Titan as LSW continues to produce incredible talents. Girls Triple Jump: Diamond Riley set a new all-classes record in the triple jump with her 40-10 mark. This was Riley's second consecutive state win in the triple jump, third straight week over 40-0, and capped off an undefeated season in the event. She also finishes the season with a US No. 18 all-conditions mark of 41-2 from the Sectional meet. A noted club competitor, we could see the senior continue to push the envelope this summer. Madison Hulsey: Lee's Summit West repeated as the Class 5 champion in the 4x800 with another strong anchor leg from Jana Shawver. But while everyone raved about the Shawver/Findley duel on the anchor leg, lost in the fray was the 2:13.69 split from third leg sophomore Madison Hulsey. The Titans were actually five seconds behind Blue Springs South when Hulsey got the baton and she was able to get Shawver the baton the same time as Findley, leading to the Class 5 record 9:13.37. Hulsey then went on to take third in both the 1600 and 3200 with seniors ahead of her in both races. Is Madison Hulsey the Class 4 favorite heading into cross country season now? 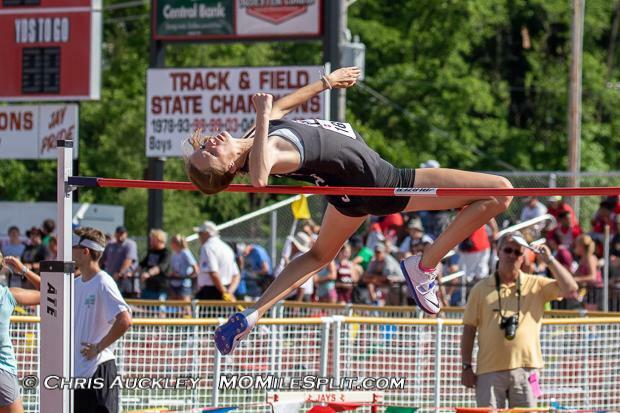 Girls Pole Vault: Elaina Roeder grabbed the state title in the pole vault this weekend with her 12-7 clearance. She ended up beating second place Mora Boatman of Ft. Zumwalt West by 1.5 feet and narrowly missed on her attempt at what would have been the new state record of 12-10.75. The Wake Forest commit was fourth in 2017. Girls 100mH: Michelle Owens ran a non-wind-legal 13.86 in the 100 meter hurdles, but all-conditions, this time is MO No. 5 all-time at the state meet. Aisha Southern finished second in 14.08. 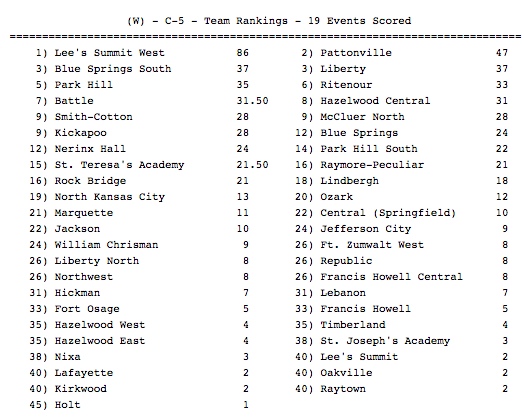 There isn't much to say here other than Lee's Summit West did almost exactly what we thought they would. "Almost exactly" because they still fell short of last year's 109 points, but they still dominated, beating Pattonville by 39 points. This year the depth in each event was not as strong as last year's team, but the top tier talent was the key to the big win. They picked up victories in all three throws events, the 4x800, and high jump with Jessica Haney's Class 5 record of 5-9. Haney also finished sixth in the triple jump. Madison Hulsey added 12 points and Jana Shawver and Audrey Parson chipped in a combined 10 in the 800. They also finished third in the 4x200 and sixth in the 4x400. With many sophomores and freshmen on the distance squad and Maddie Harris and Jessica Haney returning for 2019, Lee's Summit West will look to pull of the four-peat. 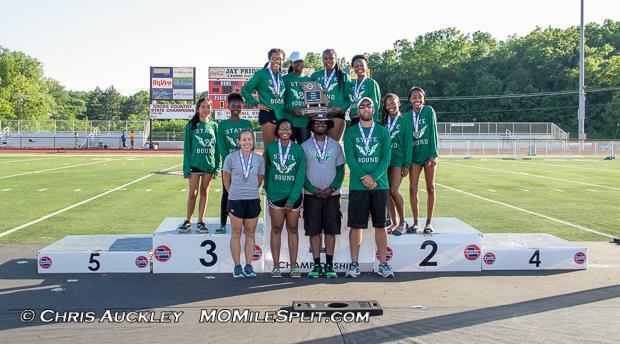 Pattonville has made a huge five-year jump going from zero qualifiers in 2013 to a second place finish in 2018. Jada Moore was the key to the Lady Pirates' second place finish as she was all-state in the 100, 200, 400, and ran a leg on the 4x400. She won the 100, finished fifth in the 400, finished second in the 200, and their 4x400 took second. Brooke Jenkins was fifth in the long jump, Diamond Richardson pulled in thirds in the shot put and discus, and Demisha Anglin took eighth in the 400. They return most of their team for next year, too, and could be a contender to end Lee's Summit West's reign in 2019. We had another tie for third in Class 5 as Blue Springs South and Liberty both tied for the final trophy spots. Blue Springs South did it almost exclusively with Victoria Findley and Danielle Hotalling as both girls earned 28 points for their team, plus the eight they added from the 4x800. 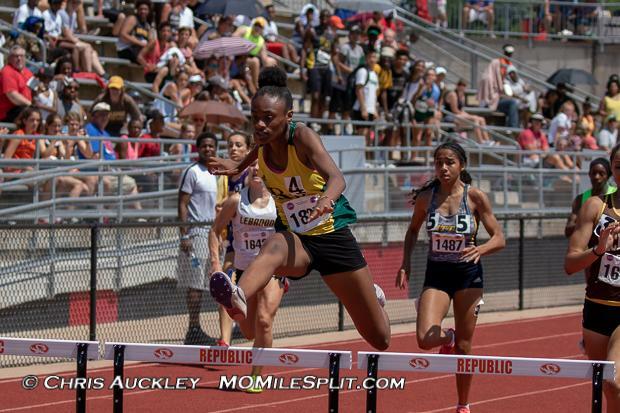 The 37th point came from an eighth place finish from Akirah Venerable in the 300 meter hurdles. Losing Findley and Hotalling will be a big blow, but there are still at least two strong underclassmen waiting in the wings in Lauren Low and Jayme Opdahl ready to take over for their graduating teammates. Liberty got eight points from Madelynn Hill in the 1600 and 800 and, after not qualifying in the 3200, she was able to contribute for her 4x400 squad as they took third. Kaitlyn Lewis was unable to pick up points for her team after an unfortunate false start in the 200, but she came back Saturday and grabbed second in the 400, ran a leg on the fifth place 4x100, and a leg on the 4x400. Caroline Crawford finished third in the high jump and Autumn Avery took fourth in the javelin to close out the scoring.